You know when you want something sweet and comforting, but what you really need is good protein and lasting energy in a snack? How about when you want cookies but you can't decide between oatmeal raisin, chocolate chip or peanut butter? This is the cookie to solve these conundrums! Plus these are gluten-free, dairy-free and refined sugar free. They are full of what you want and without what you don't. I came up with this healthy everything energy cookie recipe to satisfy my late pregnancy cravings, with ALL the flavors, and packed with organic protein, but without any wheat flour, dairy or refined sugar. It's so good, and simple to make. 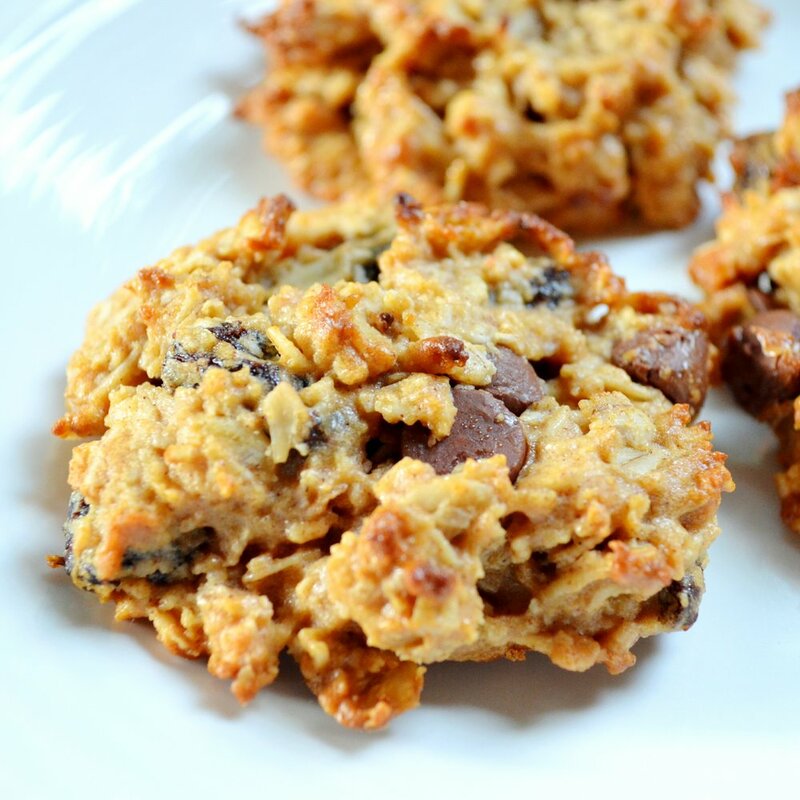 These make a great mid-afternoon snack, and also would be perfect breakfast cookie enjoyed with a morning coffee. Use organic ingredients and pastured eggs for best results, nutrition and flavor! Mix together the coconut oil, honey, maple syrup, vanilla, peanut butter and eggs in a medium sized bowl. In another bowl, mix together the oats, coconut flour, almond flour, cinnamon and sea salt. Then add the dry ingredients to the wet mixture. Stir together. Add raisins and chocolate chips and mix gently until incorporated. Place spoonfuls of dough on a cookie sheet 2 inches apart and bake for 10 minutes or until lightly browned.